The folks at Novarum, who include two of the pioneers of Wi-Fi, offer a free report on outdoor Wi-Fi network building: The recommendations aren't surprising to anyone who has followed this site. Novarum recommends a whopping 60 access points per square mile to exceed 90 percent coverage for 802.11n laptops at rates higher than expected 4G cellular network speeds. That's a high bar, but Novarum has tested existing networks, and it's not far off from what's been documented in the field. There's a joke in the report in the form of a headline on page 5 that reads, "60 is the new 20." Way back in 2004/2005, metro-scale Wi-Fi companies were saying good coverage could be achieved with as few as 20 nodes, which proved laughably low. Older 802.11g network hardware can't deliver, the company says, with 80 percent coverage provided for laptops and 50 percent for smartphones. However, Novarum also says smartphones might see just 50 to 75 percent coverage for smartphones from high-quality 802.11n network. The company recommends that 802.11n be used in both 2.4 and 5 GHz bands, and that 802.11b be avoided on clients. This report is based on 175 network analyses in 36 cities over a 3 1/2 year period. Metageek drops down a few gigahertz with the Wi-Spy 900x: The new spectrum analyzer from Metageek, in a USB dongle form factor as with previous offerings, extracts data from the 900 MHz band, an unlicensed band used for cordless phones, baby monitors, RFID tags, ZigBee, and other mishegas. The price is $199. While WLAN use 2.4 and 5 GHz, there are still plenty of purposes for 900 MHz devices, which take advantage of the better propagation available at this frequency range. MetaGeek breaks the $100 barrier with the Wi-Spy 2.4i: The company's new USB spectrum analyzer is a revision of its entry-level model, which handles 2.4 GHz (2.400 to 2.492 GHz). A spectrum analyzer constantly samples the radio frequency environment around you; software that works with the analyzer can derive graphs, charts, and other visual and numerical representations. You use a spectrum analyzer to troubleshoot problems in wireless network, identifying interferers, or to plan networks by figuring out what's already in place and testing access points' reach when you fire them up. While Ubiquiti sells 2.4 GHz spectrum analyzers that are less expensive (the cheapest can be found for $40), I believe that MetaGeek is offering higher resolution (375 KHz instead of what looks like about 512 KHz). MetaGeek also has software support under both Mac OS X and Windows (with the free Chanelizer Lite). MetaGeek also dropped the price of its next-level-up analyzer, the Wi-Spy 2.4x, which has an external antenna, and both finer and adjustable resolution. It's now just $199. The 2.4/5 GHz Wi-Spy DBx took a $200 plunge, too, and weighs in at $599. 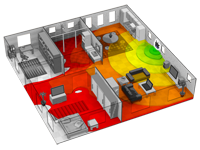 Asset-tracking software firm Ekahau releases tool to discover, map signal strength of Wi-Fi networks: HeatMapper, a free Windows XP/Vista application, performs the neat trick of letting you walk around your office or home while it continuously scans for Wi-Fi networks. When you stop warwalking and inform the program of such, you're presented with a heatmap of every network found. This lets you survey interference and see how your network deployment "looks." You can start with a raw grid or a digital image of your office or home floorplan. As you walk, you click at key points. The software does the rest. A list at left shows a live scan of networks and their characteristics. When I spoke to the program's product manager a few weeks ago for this article in Ars Technica, he said that the intent was partly to provide an up-to-date scanning package to replace NetStumbler, which has been out of development for years. New measurement firm joins two others that aim to audit performance of metropolitan-scale Wi-Fi networks: Wi-Fi veterans Phil Belanger and Ken Biba today launch Novarum, a firm that will produce 10 reports per quarter on how Wi-Fi networks that span cities and counties measure up. Novarum joins a field that's not yet crowded, but has at least two competitors I spoke with that make measurement part of larger businesses. Each of the three firms has a distinct approach to taking stock of these new networks. For some time, I've been banging the drum of network performance audits for muni-Fi, because it makes little sense for a city or civic group to ask the same group that they paid or allowed to design, build, and operate the network to also provide guidelines for evaluating that network's performance. A disinterested third party with no financial stake in the outcome of a deployment should look at tests, pilot projects, and production rollouts to determine whether coverage and performance meets the contracted specifications. I spoke with Belanger of Novarum, and the heads of Unplugged Cities and Uptown Services to learn about their methodology in measuring Wi-Fi networks of a scale that only came into being in the last year. Read the rest of "Trust But Verify: Measurement for Metro-Scale Networks"
Cisco combines hardware, design into tested packages for metro-scale deployment: The company announced their plan today to sell integrated packages of their wireless mesh equipment, wireless management systems, and routers that would let metro-scale service providers avoid building each deployment from the ground up each time. Joel Vincent of Cisco said in a briefing last week that this streamlined approach--known as ServiceMesh--will allow service providers to go from answering a city's request for proposal (RFP) to "having revenue as soon as possible." Cisco has optimized their package to integrate applications across the network, including such popular municipal examples as wireless meter reading, in-the-field building inspection reports, and general public safety communications. The idea is that with Cisco providing help on the glue that binds these top-level applications from a variety of existing municipal and enterprise vendors into the wireless network, service providers can mix and match solutions without reinventing the wheel. This would result in more consistent deployments at lower cost. Cisco's own services division can provide the design help necessary to put the integrated package together; Cisco's partners, like IBM, will also be able to bundle and resell this new offering. This new offering is tied with Cisco's announcement that eight medium-sized cities have been deployed through service provider partners with packages derived from this reference design. Vincent said that most of the upcoming city RFPs would be from sub-500,000-population municipalities where there's less of a user base across which to spread design costs, making efficient planning and upfront integration more crucial. The international market is also heating up, and Vincent expected that a fair amount of future business would come from outside the U.S., citing Singapore's near-term effort to unwire the entire country as one example. Vincent likened ServiceMesh to the way in which hardware products move from chip vendors into a broader marketplace. "If you think of a chip company that wants to spark the Wi-Fi revolution, the first product to come out was probably a reference design from the chip company. Then all the product companies took it and productized it," he said, turning it into an item to sell. When a service provider asks, how do I add wireless Internet access to a city, Cisco can provide that reference design as a well-thought-out starting point with the majority of pieces in place, Vincent said. Vincent made the fascinating prediction that most networks on this scale would wind up offering Internet access at no cost, with the area that service providers derived revenue from coming solely from specific municipal, business, and consumer applications that would run over the network. "The days of charging money just to access the network are slowly disappearing," Vincent said. "Service providers have to stand back and say as the cost of pure access and [voice] minutes decline," where will revenue come from. Cisco has worked closely with IBM to combine the design and deployment of networks, with the two companies finding a neat fit between Cisco's architecture and IBM's application focus. The two are part of two MetroConnect consortiums: the first, with Azulstar and Seakay won the Wireless Silicon Valley bid; the second, with Azulstar gave them Winston-Salem. In the former case, over 40 separate municipal entities, mostly cities, will strike separate deals with the consortium, and should give Cisco's approach an excellent test bed for both ease of deployment and adding other features to the mix. Network Computing turns in a long feature looking at tools that help troubleshoot and monitor Wi-Fi networks' health by examining the radio frequency space they operate in: The monitoring space is very hot; I'm asked all the time to be briefed on the latest product or product revision. I've demurred because Wi-Fi Networking News lacks an RF testing environment. The folks at Network Computing show how to examine the field. They look at a dozen products from several manufacturers, only some of which directly overlap by function. The reviews sort products into spectrum analyzers, calibration tools (just a single entry), wireless protocol analyzers, site surveying tools, and performance and security evaluators. Spectrum analyzers look at the RF patterns and are typically intended for more sophisticated users and uses; protocol analyzers deconstruct data into known patterns to see how the airspace is being used by data devices. A spectrum tool can show if a microwave oven is disrupting your network or an errant cordless phone, while a protocol tool will let you see how 15 networks on the same channel in a small space are producing throughput degradation. A big caveat in the protocol analysis category is how well the products can decrypt packets when you have the network keys, and how they deal with authentication and dynamically generated Wi-Fi encryption keys. To cap off the article, there's a sidebar on free tools that can perform a subset of the functions covered in the feature. Chipmaker Engim and WLAN monitoring firm AirMagnet partner for powerful three-radio-in-one solution: Engim's chipsets can provide the equivalent of several radios within a single design. The chips process all of the signals in the 802.11a, b/g, or a and b/g bands (depending on configuration) and then dole out the details to on-board media access controllers. This lets them coordinate and analyze frequency use in a way that multiple physical radios cannot. The neat part of this is that the silicon gives access to the spectral picture in a way that can be broken off and used separately. Airespace was the first firm to combine spectrum analysis with WLAN access points in a single device, and they accomplish this by licensing the code from Atheros that gives them access to the baseband; Trapeze now offers the same. However, a partnership between Engim and AirMagnet on Engim's reference design will allow the two companies to offer three radios in a single box in which two can be set to be access points and a third can be a dedicated AirMagnet monitor. AirMagnet's system can track performance problems on a network, identify rogue access points (unauthorized Wi-Fi), and detect intrusion. Like most monitoring software, it can even disable rogues through a denial of service attack focused on the "illegal" access point. Rich Mironov, vice president of marketing at AirMagnet, explained in an interview that the company has never wanted to be in the hardware business, but that until now they have needed to create and sell their own overlay of sensors for a WLAN. This partnership will allow them to transition gradually to a pure software business. Mironov said, "We've taken all of our sensor software and we're putting it inside the Engim device." "Today, you might be buying three separate devices, two access points and one of our sensors, and here we have the chance to roll that into one physical device at much lower cost and much lower deployment cost," Mironov said. The Engim reference design has not yet been sold to any OEMs, or companies that will integrate the design into their own product needs, but announcements are expected in the near future from WLAN switch makers. All WLAN systems outside of Airespace and Trapeze that offer monitoring using access points have to drop the AP's clients, switch to monitoring mode, gather information, and switch back to AP mode. This disrupts low-latency connections, such as voice over WLAN (VoWLAN), and isn't elegant. Even switchmakers agree, but it's necessary that they offer such an option to companies that didn't want to deploy a separate AirMagnet or other monitoring network. Mironov pointed out that such an approach misses critical data, too. "If you don't maintain a sort of stateful constant watchful view of what's going on, you miss all the interesting attacks," he said. AirMagnet is in the remarkable position right now of having their prototype version of the software that will be embedded in Engim's design ready to go--they're just waiting for the deals to be inked and the production lines to run to finalize specific featuresets for each vendor. TamoSoft's latest monitoring software revision can handle rogue detection and WPA in Pre-Shared Key mode: The software allows network monitoring of wireless LANs. The WPA-PSK decoding is trumpeted as a unique feature, yet I would suspect networks that would purchase this package would be unlikely to use PSK mode, and would only be using WPA in 802.1X authentication; the 4.2 update can decode 802.1X, as well.